There is a perfect Tahiti resort for you and your family, whether you arrive on Tahiti for pleasure, business or just to relax . Luxury and overwater accommodations can be found at the InterContinental Tahiti Resort and Spa and at Le Meridien Tahiti. You can marvel at the black sand beach at Tahiti Pearl Beach Resort or you can find kitchenettes at the Manava Suite Resort. There are inner city units that sparkle like Tiare Hotel and the Hotel Tahiti Nui which have right in the bustling town of Papeete. If you are seeking something on a remote private island then try The Brando which offers an idyllic tropical landscape. There is plenty to explore on Tahiti including fabulous snorkeling as well as scuba diving opportunities and Tahiti is the perfect stop off when you are either beginning or ending your French Polynesian vacation. If you are looking for a luxury Tahiti resort that has plenty of onsite amenities and is perfect for families as well as couples seeking romance, then try the InterContinental. Located on the northwestern shoreline of the island just minutes from Papeete in the town of Faa'a, the InterContinental is situated on 32-acres of lush tropical paradise along a beautiful lagoon. The InterContinental has a mixture of modern and Polynesian architecture with 246 rooms as well as suites which feature a contemporary Polynesian decor. Standard, Garden and Lagoon view rooms have 371 square feet of living space with a choice of bedding and private balcony which boasts views of the resort, garden or lagoon. Superior Garden and Lagoon view rooms have a similar floorplan and offer bigger views. Panoramic Garden and Lagoon view rooms are sized at 414 square feet with a choice of bedding and private balcony. The Panoramic Suite has 1,213 square feet with one-bedroom, a separate dining and living room and a private balcony with views of the lagoon. Lagoon Overwater Bungalows have 543 square feet with an integrated living area and a sundeck which provides direct access to the water. The Superior Lagoon Overwater Bungalow is sized at 576 square feet with a separate lounge area as well as a large sundeck with direct water access. The Motu Overwater Bungalow features 742 square feet of living space with a huge sundeck with direct access to the lagoon. The Villa Motu Overwater Bungalow is sized at 1,022 square feet with a glass viewing table on the interior, an integrated living room and a large sundeck with direct access to the water. The Lagoonarium and beach area at the InterContinental Tahiti Resort and Spa is fabulous for sunning, swimming and snorkeling. Other watersport and land based attractions can be booked at the activity desk or through the onsite dive shop. The InterContinental has a fulltime entertainment staff that hosts classes on hula dancing, lei making and other cultural activities. The InterContinental Tahiti Resort and Spa has two fresh water swimming pools including one with a sandy bottom and swim-up bar. The property contains a fitness center, dive shop, shopping boutique and a full service spa. Dining options onsite include Te Tiare Restaurant which serves all three meals and Le Lotus Restaurant feature overwater gourmet dining. Offsite dining options within walking distance include the Ocean Restaurant for Asian and L'Annexe prepares steaks. Nightlife is abundant with a weekly Tahitian dance performance and live music at the Tiki Bar. When you are seeking a Tahiti resort that has spacious accommodations and relaxed yet lively atmosphere, then the Manava Suite Resort is perfect for you and your family. Located on the western coastline of the island in the town of Puna'auia just 10-minutes south of Papeete, the Manava Suite Resort is situated on a nice sandy beach only minutes from the popular scuba diving and snorkeling site of Lagoonarium. The Manava Suite Tahiti Resort features a contemporary architectural style with Tahitian flare that contains 109 rooms and suites that boast a stylish contemporary island decor. Standard rooms have 323 square feet of living space but do not have a balcony. Garden and Lagoon studios offer 441 square feet of living area with an integrated floorplan that includes a kitchenette and a large private terrace with views of the gardens, lagoon or Puna'auia Mountains. Garden and Lagoon suites have 635 square feet of living space with an integrated living room, separate dining area, kitchenette and a private balcony with views of the gardens or lagoon. The one-bedroom Duplex suite has 735 square feet of living area that features a separate living room, kitchenette and two private terraces which have mountain as well as garden views. The Manava Suite Tahiti Resort has a small sandy beach area that includes a great sundeck as well as a pier and is good for lounging and swimming. You are only minutes away from the Lagoonairum which sports incredible snorkeling as well as scuba diving opportunities and you can arrange other watersport activities with the concierges. You are an easy drive to Papeete where you can visit the Paofai Gardens or you can take a short drive to the ruins at Arahurahu Marae. The Manava Suite Resort has the largest Infinity freshwater swimming pool on the island with spectacular ocean views and a great sundeck for lounging as well as poolside service from Taapuna Pool Bar. The property contains a fitness center, shopping boutique and full service spa. Dining choices onsite are limited to the Vaitohi Restaurant where you can indulge in French Polynesian cuisine for all three meals. Offsite choices within walking distance are Captain Bligh serves Polynesian favorites and the Blue Banana prepares French Polynesian specialties. Nightlife brings a lively crowd to the Punavai Lounge Bar where you can listen to live music and mingle with locals. When you are searching for a luxury Tahiti resort that offers a trendy atmosphere with plenty of onsite amenities for romance as well as families, then the Le Meridien Tahiti is ideal selection for you. 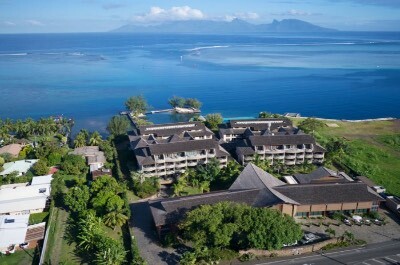 Located on the western shoreline of the island near Punaauia just 20-minutes from Papeete, Le Meridien Tahiti is situated on the Nu'uroa peninsula along a nice sandy beach. Le Meridien Tahiti has a modern architectural style that is combined with traditional Polynesian features and contains 149 rooms and suites which boast a trendy island decor. Standard, Garden and Garden Family rooms have 550 square feet of living area with a private balcony that has views of the gardens, resort or pool. Deluxe Ocean and Family Ocean view rooms are 550 square feet with two queen beds and views of the ocean from a private balcony. Panoramic Oceanfront rooms have a similar floorplan with big views of the lagoon and ocean. Junior suites have 895 square feet of living space with a big view of the ocean from a private balcony. One-bedroom suites have 1,410 square feet of living area with a separate living room and private balcony with ocean views. The Presidential suite features 1,926 square feet of living space with one-bedroom, a separate living room and an extended balcony that has ocean views. The Overwater Bungalows are sized at 602 square feet with a large outdoor terrace and provide for direct access to the lagoon. 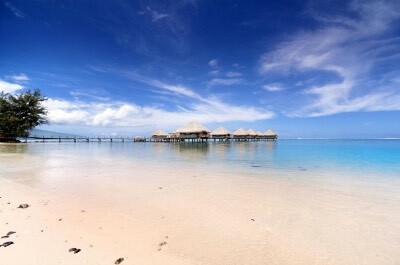 Le Meridien Tahiti resort has a nice beach area for you to lounge on with good swimming and snorkeling opportunities. You have access to complimentary snorkeling equipment as well as kayaks and you can arrange your favorite water based adventure onsite. You can stroll through the lively local arts scene which is displayed at the new L'Atelier near the lobby. Le Meridien also offers art workshops, lectures and receptions for new artists. Le Meridien has a perfect sandy bottom freshwater swimming pool that overlooks the lagoon that is complete with the tiki-style Le Pool Bar. The property contains an art gallery, tennis courts, shopping boutique and full service spa. Le Meridien Tahiti resort has two restaurants onsite that include La Plantation Restaurant which serves international favorites for all three meals and Le Carre Restaurant features international cuisine in the evening. You can also have light fare during lunch at the Le Pool Bar. Offsite dining options within walking distance include Le Coco's for French, Chez Remy serves European dishes and Le Nemo Restaurant prepares Polynesian. Nightlife is ideal at L'Astroable Bar for a sunset drink and there is live music on selected nights. If you are looking for an upscale and chic Tahiti resort that tends to cater to young adults and couples, then you should try the Hotel Tahiti Nui. 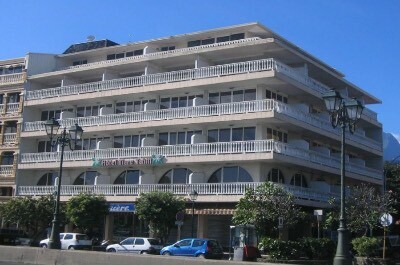 Located in the heart of downtown Papeete on the northwestern coastline of the island, the Hotel Tahiti Nui is situated within an easy walking distance to Port Papeete and the pier. The Hotel Tahiti Nui has a beautiful modern architectural design with 91 rooms and suites that boast a chic Polynesian decor. Standard rooms have 322 square feet of living space with a choice of beddings and a private balcony with city or mountains. Junior suites are sized at 645 square feet with a separate living room, a kitchenette and private balconies that boast views of the city or mountains. This unit can be adjoined with a standard room for families or people looking for more sleeping space. The Executive suite sports 925 square feet of space with two-bedrooms, two bathrooms, separate living room, kitchenette and private balcony with views of the city or mountains. The Hotel Tahiti Nui has a perfect central spot for sightseeing with the municipal market, Cinema Concorde, the Paofai Gardens and waterfront shopping all within walking distance or you might decide to take the ferry to the neighboring island of Moorea for the day. The Hotel Tahiti Nui has a great freshwater swimming pool with a nice sundeck overlooking parts of the city. There is also a fitness center and full service spa onsite. Dining includes breakfast at Chocco Latte Lounge Bar and lunch as well as dinner is served at Le Velvet. Offsite dining choices within walking distance include Papeeete Roulottes for French Polynesian cuisine, Le Grillardin prepares European dishes and Les 3 Brasseurs has international pub fare. Nightlife at this Tahiti resort includes a drink at the trendy Chocco Latte Lounge Bar onsite or venture offsite to Vaiete Square which is magical at night with food vendors and live music on a nightly basis. When you are looking for an upscale Tahiti resort that is ideal for romance and children, then the Tahiti Pearl Beach Resort has just the right amenities for you. 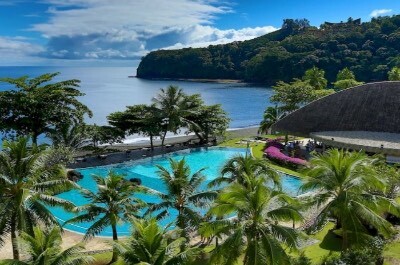 Located on the northern shoreline of the island just 10-minutes from Papeete, the Tahiti Pearl Beach Resort is situated on the black volcanic sands of Lafayette Beach overlooking the blue waters of Matavai Bay. The Tahiti Pearl Beach Resort has a modern low-rise architectural style with 91 rooms and suites that boast a chic island decor. Deluxe Ocean view rooms are 463 square feet with a balcony that overlooks Lafayette Beach and are available with a Jacuzzi. Premium Deluxe Ocean view rooms are sized similar but feature a panoramic view of Matavai Bay and are available with a Jacuzzi. The Ocean view suite has one-bedroom and 786 square feet with a separate living room as well as a private balcony with views of the bay. Premium Ocean view duplexes feature 786 square feet of living area on two-levels with a large living room below, one-bedroom upstairs with floor-to-ceiling windows and two balconies with panoramic views of the bay. The Premium Ocean view two-bedroom suite is sized at 1,249 square feet with a separate living room, two bathrooms, a full kitchen and a large outdoor space with panoramic views of Matavai Bay. The Tahiti Pearl Beach Resort has a perfect spot on the black sand Lafayette Beach where you can lounge. The water tends to be rougher here and the swimming is possible when the waters are calmer. You have access to complimentary non-motorized watersport equipment and you can arrange for your favorite adventure at the activity desk. The Tahiti Pearl Beach Resort has a free shuttle bus you can take into Papeete to enjoy more offsite explorations. The Tahiti Pearl Beach Resort has a fulltime entertainment staff which features cultural and sporting events throughout the day. Children will be pleased with the activities offered within the kid's club. This Tahiti Resort has a freshwater Infinity swimming pool which overlooks Matavai Bay. The property contains a fitness center, shopping boutique, kid's club and full service spa. Dining at the Tahiti Pearl Beach Resort includes Hiti Mahana which serves Polynesian influenced cuisine for all three meals. Offsite dining requires a drive with selections that include Le Souffle for European dishes, Le Maru'Kafe serves barbeque and Dahila prepares fresh Chinese cuisine. Nightlife includes an interesting Marquesan Show, a Polynesian performance with hula dancers and traditional music as well as live music at Bay Bar on selected evenings. 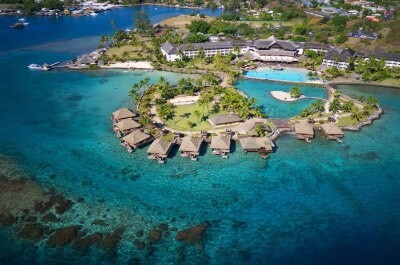 The Tiare Tahiti Hotel is a perfect Tahiti resort for business travelers, couples and families who are searching for nice accommodations as they arrive or depart from the island. Located on the northwest shoreline of the island just five minutes from Tahiti Fa'a'a International Airport, the Tiare Tahiti Hotel is situated overlooking the Port of Papeete in one of the best neighborhoods in the capital city of Papeete. 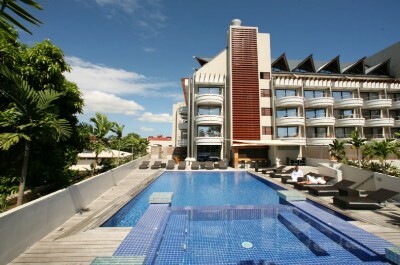 The Tiare Tahiti Hotel is a modern five-story building that contains 38 rooms which feature a simple modern decor. Standard rooms are normal size with a choice of bedding and no balcony. Upgraded standard rooms with a balcony are similar in floorplan and feature views of the Port of Papeete as well as the surrounding mountains. The Tiare Tahiti Hotel has a perfect within the city of Papeete and is within walking distance to many fabulous attractions like the municipal market, Notre Dame Cathedral and Bougainville Park as well as the Robert Wan Pearl Museum. There are no amenities such as a fitness center or swimming pool onsite. Dining includes an onsite restaurant that serves continually from 6:30 A.M. until 9:30 P.M. serving a variety of cuisine from Polynesian to European to French. Offsite dining choices within walking distance include L'O a La Bouche for French, Restaurant Fuji for Japanese and Papeete Roulottes. Nightlife at this at this Tahiti resort includes a quiet drink along the waterfront or dancing at Ute Ute. If you are seeking a luxury and environmentally friendly Tahiti resort that is ideal for couples, then the Brando is a must stay place for you. Located 30-miles northeast of Tahiti on the Tetiaroa atoll, The Brando is situated along the coastline of the private Motu Onetahi owned by Marlon Brando. The Brando at this Tahiti resort is an environmentally self-sustaining property that has a Polynesian architectural style with 35 individual villas that sport a chic Polynesian decor. One-bedroom villas are sized at 1,033 square feet with a separate living area, an extended outdoor living space, a private plunge pool and features jungle views. Two-bedroom villas have 1,808 square feet with two-levels of indoor living space that include a separate living room, full kitchen, private plunge pool and a two-tiered deck which boasts an additional 1,658 square feet of outdoor living space with jungle as well as ocean views. The three-bedroom villa is located on Mermaid Bay featuring direct beach access and has 2,648 square feet with a separate living room, full kitchen, two bathrooms as well as a private 236 square feet swimming pool that has an extended outdoor living space. The beautiful white sands of Mermaid Bay are perfect for lounging and the water is crystal clear for swimming as well as snorkeling. You can venture around the island on bicycles and you can explore the lagoon by kayak, outrigger canoe, on a standup paddleboard or take a scuba diving lesson. Other activities like nature based hikes with a biologist, bird watching as well as cultural events such as hula and ukulele lessons are complimentary. Children will be thrilled learning about the eco-system from a trained biologist while attending the Lagoon School. There is a stunning beachfront fresh swimming pool with a gorgeous deck for relaxing. The Brando contains tennis courts, a fitness center, shopping boutique, research station and a full service spa. Dining onsite includes the Beachcomber Cafe which serves French and Polynesian cuisine for all three meals. Les Mutines is open for dinner with French Polynesian specialties. Nightlife at The Brando at this Tahiti resort brings a traditional Tahitian show weekly to the Brando, live music at Bob's Bar and evening lectures by the resorts scientists.